Say goodbye to tired, dry, flaky skin with our invigorating and brightening Avocado body scrub. Mineral-saturated dead sea salt will gently exfoliate your skin to reveal younger, fresher looking skin underneath. Avocado oil will nourish your skin on a deep level, leaving it incredibly soft and supple, while powerful antioxidant vitamin C will brighten and rejuvenate your skin and stimulate the production of collagen, which plumps the skin and makes you look instantly younger. Our proprietary scrub formula may seem more dry than other scrubs, but after using, it will leave your skin exfoliated and extremely moisturized. Our Vitamin C Scrub also contains · Organic Aloe Vera, which promotes wound healing and has intense anti-inflammatory and anti-aging properties. It's also known to improve the texture and tone of skin · An infusion of skin-softening, nourishing oils, such as Organic Coconut oil and Jojoba oil, which will leave your skin with a radiance that celebrities will envy! For best results, use this together with our Charcoal Scrub. Be sure to check out our Avocaderia Limited Edition Body Scrub as well! 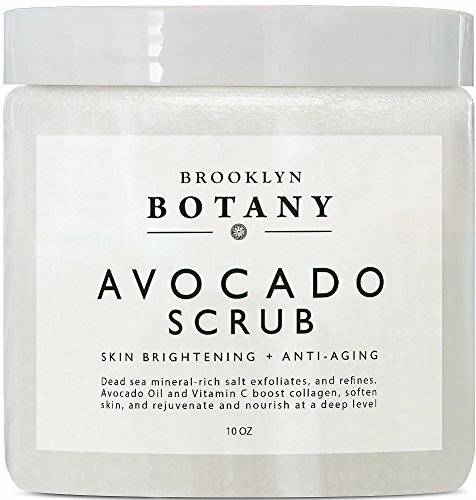 SKIN BRIGHTENING & ANTI-AGING BODY SCRUB: This Avocado body scrub contains coveted salts from the dead sea, along with a special blend of nourishing oils and other natural and organic ingredients, which will exfoliate tired winter skin and leave it smooth, fresh, and hydrated in time for the summer. Avocado oil boosts collagen production, softens skin and, thanks to its sterolin-containing properties, hydrates by penetrating the skin at a deeper level than many other oils are able to achieve. PREMIUM BLEND OF NATURAL AND ORGANIC INGREDIENTS: Our blend of active, botanical ingredients work in synergy to bring an enviable glow to tired, dull skin. This unmatched blend includes Vitamin C, Organic Aloe Vera, mineral-rich salts from the dead sea and Organic Coconut, Kukui Nut and Jojoba oils, all of which will brighten and rejuvenate skin, leaving it healthy, renewed, and youthful. AVOCADO + VITAMIN C: Vitamin C Scrub is one of the most powerful antioxidants available in skincare and is proven to reduce signs of aging. Combine that with Organic Aloe Vera, with its myriad anti-aging properties, and plumping, rich Avocado oil, and you have a rich, youth-boosting formula on your hands. Our scrub revitalizes and hydrates at the same time. PERFECT FOR ALL SKIN TYPES: Our proprietary scrub formula may seem more dry than other scrubs, but after using, it will leave your skin exfoliated and extremely moisturized. Thanks to its range of intensive active ingredients, our skin brightening Avocado Body Scrub is a refreshing cleanse for every skin type. View More In Body Scrubs. If you have any questions about this product by Brooklyn Botany, contact us by completing and submitting the form below. If you are looking for a specif part number, please include it with your message.